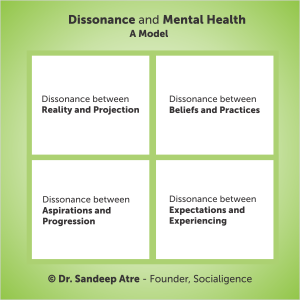 Mental health suffers when there is dissonance in life. First, when there is dissonance between your ‘reality’ and your ‘projection’. For example, if you are average but you project yourself as very knowledgeable; or if your relationship with your partner is deteriorating but you show as if you are a happy couple. Second, when there is dissonance between your ‘beliefs’ and your ‘practices’. For example, if you believe in modestly & simplicity but you have to show off because of the orbit you are in; or if you believe in honesty but you have to use unfair means due to peer pressure. Third, when there is dissonance between your ‘aspirations’ and your ‘progression’. For example, if you want to be a guitarist but you are pursuing civil engineering; or if you are thinking about separating but end up conceiving a child with the troublesome partner. Fourth, when there is dissonance between your ‘expectations’ and your ‘experiencing’. For example, if you had a ‘glittering marriage ceremony’ and ‘promises of fairytale life’ but afterwards can’t deal with routine life of a married person; or if you expected Post-MBA job to be glamorous but find it more of a drudgery.